Samblis… shooting the messenger… AGAIN ! Yes folks, yet again Mr. Steven M. Samblis spends his time shooting the messenger instead of addressing the issues. Mr. Samblis apparently has enough free time on his hands that he can create tumbler posts where he attacks the messenger, but not one word of it addresses the very important issues and questions on investors minds. Apparently Mr. Samblis is an expert at shooting messengers, but running a company, well, not so much. So, the issue in the forefront of most investors minds is… Mr. Samblis’s supposed exit from the public company. There are some who believe he really has sold, and/or left the company. While most others are not buying it at all. So… apparently in an effort to put all the speculation to rest, Mr. Samblis creates his most vehement denial to date, stating that he is no longer affiliated with the company. See the post here. Yes, the post is laden with personal attacks (shooting the messengers), but none the less, its the most direct, to the point, denial that he is still involved. That ends the controversy, right? Well, not so fast. Mr. Samblis DELETES the post only hours after posting it. With the controversy so intense, coupled with Mr. Samblis’s strong denial… WHY would he delete it ??? He surely didn’t remove it because he was remorseful he attacked his detractors, he continues to do so in his most recent tumble post. Additionally… when Mr. Samblis discovers that Friends has captured the deleted post and made it available for readers… we get nasty emails ordering us to remove the link to the post. WHY is Mr. Samblis so upset that the post is being made available? ( Here are the emails Mr. Samblis sent to Larry regarding availability of the deleted post.) This is Mr. Samblis’s strongest denial to date, and he not only deletes the post, but gets angry when it is still available for folks to see. WHY ? Not only do we get nasty emails (do most CEO’s write emails like this?) Mr. Samblis then files a DMCA (Digital Millennium Copyright Act) complaint. Of course, as you can see, this complaint was denied (as were his numerous other complaints also). (See the complaintt here.) And, by the way, for those of you new to IMTV, here is a link to details where Mr. Samblis attempted, and failed, to steal our sites from us. Once again, Mr. Samblis was defeated in his efforts. So… investors must be asking themselves… WHY does Mr. Samblis so vehemently deny his involvement with IMTV, then delete the post, AND take extraordinary actions to keep it from the public ? Does Mr. Samblis address this in his most recent rant where he once again attempts to shoot the messenger? No – he does not. WHY ? 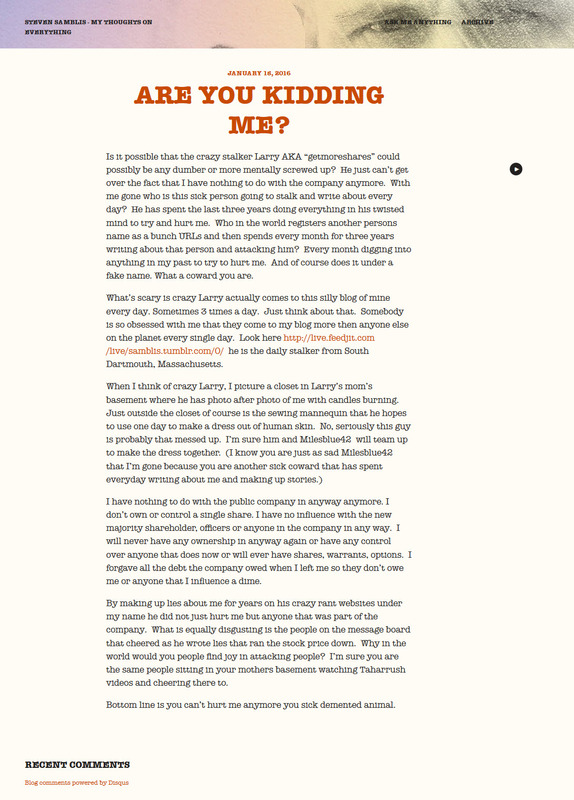 Mr. Samblis wines in his latest rant about his lost “business deals, relationships, and friendships“, but fails to mention that those folks he speaks about have minds of their own. They likely have read the material available on the internet about Mr. Samblis, and made their own minds up based on the facts. The facts are there, the reader makes up their own minds to believe the facts or not. It is hard to argue the information is all lies, when the documents are there for all to see. Mr. Samblis has had ample opportunity to address these “lies” as he calls them, but does he do it… NO ! He rather attempts to shoot the messenger. He thinks that is a better tactic then addressing the facts head on. Another question… WHY, if there really is a new owner, has he not presented himself, and defended his new company? Mr. Joseph Collins wasn’t timid about stepping up after his appointment as President. Ask youself… if you just bought a company, and folks were saying the old CEO (who many dislike) was still calling the shots… wouldn’t you put out a press release ASAP ! Wouldn’t you make EVERY attempt to dispel the rumors? Yes… “Guessing is fun”, but when it comes to investing your hard earned dollars, get the facts ! The facts are available with a simple Google search. Read the material, and YOU make the decision if the available material on Mr. Steven M. Samblis is accurate and believable or not. Well, most likely you have seen the Mr. Steven M. Samblis tumbler post. The one where he appears to attempt to desperately convince readers that he no longer has anything to do with the public company( IMTV). WHY ??? WHY does someone who states he no longer has anything to do with the company, tries so desperately to convince you (the potential investor) that he is no longer involved ??? It’s likely many others are asking the same question. It just defies all logic. Why would he care ? Well… the old adage is, if something makes no logical sense – follow the money. Oh wait… you can’t follow the money because it was a PRIVATE sale. In other words… the parties to the contract of sale didn’t want you to know what the deal was. Nothing suspicious about that, right? Mr. Samblis… if you want readers to believe you have noting to do with the company… simply file the contract of sale with the SEC. According to the 8K, there is a contract of sale. So Mr. Samblis, why take to a tumbler post to try so desperately to convince readers of your honesty, when the most direct route to that end would be to release the contract of sale to the SEC ? Mr. Samblis appears very bitter and angry, in addition to desperate in the post, trying to convince readers, once again, he is the victim. Once again, WHY would he be extremely bitter over folks thinking he is still involved ? Logic, and common sense would tell many, it’s because he still has something at stake regarding the public company. Perhaps Mr. Samblis is bitter and angry that the plan to hit the reset button, has failed, like so many of his other initiatives (which were also not released to the SEC). This tumbler post by Mr. Steven M. Samblis appears to be the strongest evidence yet that he still has some interest in the public company. If not, WHY the “Private” sale, and WHY withhold the document from the SEC??? Mr. Samblis… you want readers to believe you – it’s simple… file the contract of sale with the SEC ! IMTV was (and is) a public company at the time of the “sale” – the contract should be made public. You owned the company, you are a party to the contract, you can file it. UPDATE: Well, that post didn’t last long. As Mr. Samblis frequently does, he creates posts, or makes statements, such as the $192,000 per airport statement he made in the Stock Traders Radio broadcast, or the arrest page at MugShots.com, and others too numerous to list here, then he deletes the posts or broadcasts for unexplained reasons. Well readers are free to draw their own conclusions about the original statements, and the subsequent deletions, and they frequently do. Perhaps that is why many are not buying his latest desperate statement that he is no longer involved with IMTV. However, as they say, once on the internet – always on the internet. For those that wish to verify the information in our post above… HERE is the captured post as it appeared after it was published. Folks… some investors share the same sentiment as the post shown below. (click to enlarge) They also think that this is a brand new company, with brand new leadership, brand new ideas, and will bring brand new profits for their investments. Folks… if they wanted you to know the details of the sale… it would not have been “Private” ! There is a reason people conduct business in private – it’s because they don’t want you to know what they are doing. That concept is not rocket science. We mentioned it in our post here, those who don’t know, and/or respect history – are doomed to repeat it. And, there is plenty of very reliable history on this company, and Mr. Steven Samblis, available with just a few minutes on any search engine like Google. History really does tend to repeat itself. There is no dispute that many investors, that most likely considered themselves experienced and cautious investors, lost a lot of money on this company. Just do a little research and you can confirm this fact. Now, if you’re thinking the history of this company, and Mr. Steven Samblis doesn’t matter anymore because of the change in ownership… you would be wise to revisit the concept of “Private sale“, and the possibilities that exist when the principal parties don’t want you to know what the real story is. Here is one sure bet… if it was of ANY benefit to YOU, the deal would most likely not been “Private”. You, the potential investor, do not know if the contract was 1 page, or 100 pages. You have NO idea what else could have been in the contract of sale regarding compensation and/or continued ownership of the public company. However, it’s a safe bet that it was favorable to Mr. Samblis or he would not have consummated the “sale”. Re-Read the 8K, and notice the word choices that were used. When investors read the 8K they would be wise to think about the history of this company, and Mr. Steven Samblis’s previous actions running the company, and his integrity with respect to some of his previous promises. Think to yourself, what other meaning COULD those words be used for, such as evasive, or misleading, or escape clause type of duel meaning works. Mr. Samblis is very good in the art of using duel meaning words – just ask him is he ever “sold” any shares. MilesBlue42 is spot on when he rhetorically asks why Mr. Samblis so infrequently files 8K notices about grandiose initiatives that he releases simply as press releases. One could assume that he does not want to go on the record with the SEC about the plans. Investors should be asking WHY? Folks… you would be wise to respect the history of the company and Mr. Steven Samblis every time you start to think something new is about to happen here simply because of a “Private sale” that by it’s very nature, didn’t provide you with all the details any investor should have before making an important decision. Just a note to those who think Mr. Steven Samblis is gone from the TV network business, might want to do a little DD on Envision-TV. Yes folks, there is already a re-branding underway in the form of a new website, and Facebook page. Check them out and decide for yourselves if you think there is a relationship to Mr. Steven Samblis. Also, scroll down to the bottom of the page on the website and notice the new company name, Fortune Road Media. Google that name and look at the site… look familiar? p.s. Wasn’t the new CEO billed as a “Marketing Genius” ? So folks… Mr. Steven Samblis is gone from IMTV and the public company world. Well, maybe not. As we indicated in our post from October 23rd of 2015, Mr. Samblis could install a straw CEO and carry on as normal. Is that what is happening with the latest news? Some say… the news was delivered via an 8K filing, how could it be bogus? Well, Mr. Samblis is no stranger to inaccurate SEC filings. Our post on November 17, 2014 lists several examples where the evidence points to Mr. Samblis having misled, or lied, to the investing public, (items 3 & 4 specifically). So, those folks who have been involved with Mr. Samblis for many years would no doubt question the validity of this latest SEC filing. The entire explanatory section starts out with “As a result of a private transaction…“. So all that any concerned parties know is what the principal parties want you to know. It is very likely that interested parties don’t know what the principals didn’t want you to know. Experience folks like Maynerd understand the history behind Mr. Steven Samblis. Maynerd’s posts, here and here, put this latest news into perspective quite nicely. As they say… the devil is in the details – and investors likely don’t have all the details. This was a “private” transaction… who knows what the back story is. Many long-time investors of Mr. Samblis would say, it is HIGHLY unlikely Mr. Samblis has completely removed himself from all aspects of IMTV. MilesBlue42 also brings a historical perspective to this issue with his post here. Asher influence very likely played a large role in not only the apparent change of leadership, but all the new aliases showing up today to pump the stock. Asher very likely had a ton of shares to unload in order to recover, and profit, from the many convertible loans to Mr. Steven Samblis. You know… all the shares Mr. Samblis never sold ! Sad to see so many uninformed investors take another bath on this company. Of course there will be the pumpers who say they are in it big time, and suggest to others that they “load the boat” because under new leadership this company is going “to the moon”. Ask a few of the previous investors if they have heard this before. They could give you 10-years worth of pumped up hollow failures. So folks… stay tuned. As the quote states… “Those who cannot remember the past are condemned to repeat it“. Well… a few minutes with Google will educate the curious potential investors thinking about “loading the boat” into getting the full story behind this company, and the man who ran it for over 10-years. Oh wait… he is no longer involved. Yea… riiiiiiiiiiiight !